Determining Treatment Settings Fractional laser systems allow you to customize proce- dures by varying the energy and density settings. While these settings do vary by manufacturer—"Density and energy levels are more device-dependent than anything else," says Dr. Gold—there are some basic guidelines as well as clinical endpoints that can help you determine the right combination. Dr. Nazarian uses a 2490nm Er:YAG laser for pa- tients requiring superfi cial resurfacing and notes that a thermal damage zone of 50 μ or more is needed for photocoagulation. For perioral rhytides, she performs multiple passes at 150 μ ablation, followed by one pass at 30μ ablation limited to areas of residual lines until pinpoint bleed- ing is visualized. For periorbital lines, she has seen improvement with a single treatment of 80 μ ablation and 50 μ coagulation. Patients with lax lower eyelids, subciliary lower blepharoplasty or sclera are at higher risk for ectro- pion and should be treated at a lower fl uence or density. Dr. Alexiades determines the energy level and density based on the degree of rhytides and solar damage. For severe cases, she employs the highest fl uence and high densities with at least one pass to the most affected areas. If a patient is a slow healer or has sensitive skin, she'll employ lower fl uences and lower densities. She also considers recovery time. "For patients who must return to work or social activities within a certain timeframe, I may use lower settings with the understanding that I'll repeat the treatment to attain the desired outcome," she says. 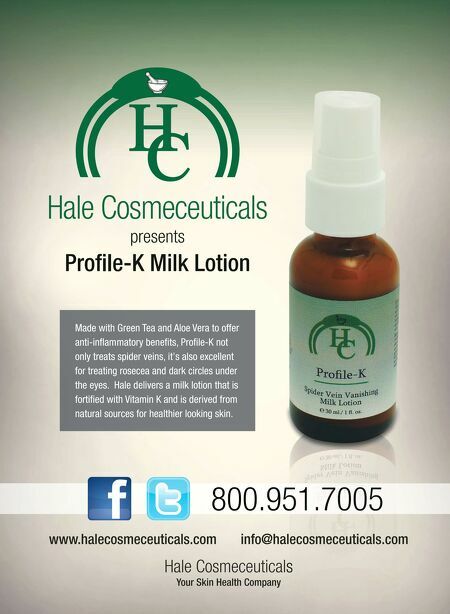 In the majority of cases, Dr. Alexiades performs only one pass with the fractional CO 2 laser. "But if the rhytides are severe, I administer a second pass. I am always on the lookout for any signs of charring, which include yellowish-brown debris," she says. If she sees such signs, she re frains from further passes or decreases the settings—in particular the dwell time that correlates with thermal injury. She notes that if the microzones of ablation are too superfi cial, the white color will not be opaque; this indicates that you need to use a higher fl uence. In addition, she looks for immediate contraction—a sign that the proper power is employed—and titrates accordingly. For Dr. Nazarian, clinical endpoints include pinpoint bleeding or coagulation, depending on the settings and laser used. Because CO 2 lasers cause more signifi cant coagulation, these procedures result in a relatively blood- less fi eld, while Er:YAG is a more bloody procedure. 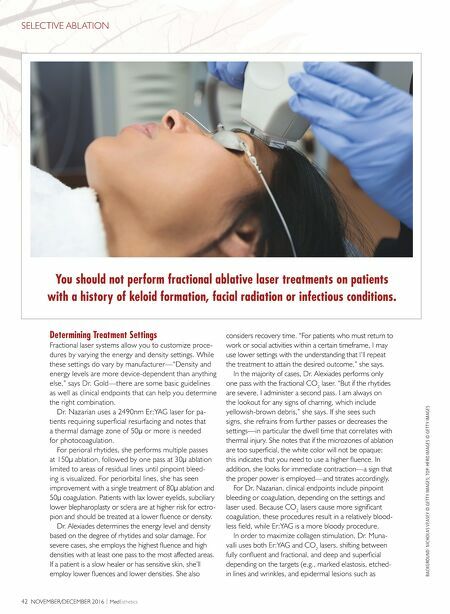 In order to maximize collagen stimulation, Dr. Muna- valli uses both Er:YAG and CO 2 lasers, shifting between fully confl uent and fractional, and deep and superfi cial depending on the targets (e.g., marked elastosis, etched- in lines and wrinkles, and epidermal lesions such as 42 NOVEMBER/DECEMBER 2016 | Med Esthetics BACKGROUND: NICHOLAS VEASEY © GETTY IMAGES; TOP: HERO IMAGES © GETTY IMAGES SELECTIVE ABLATION You should not perform fractional ablative laser treatments on patients with a history of keloid formation, facial radiation or infectious conditions.